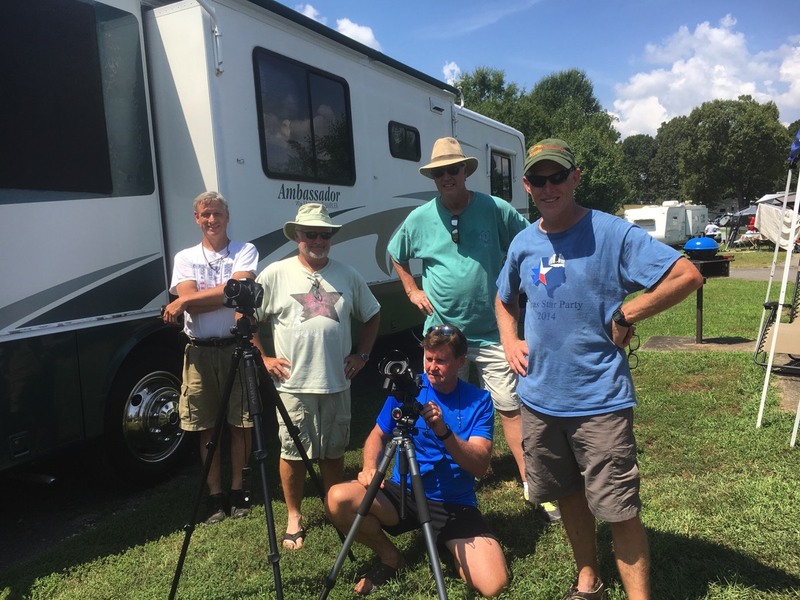 This page is the chronicle of our trip to observe the 21 Aug 2017 Solar Eclipse from Gilbertsville, KY. 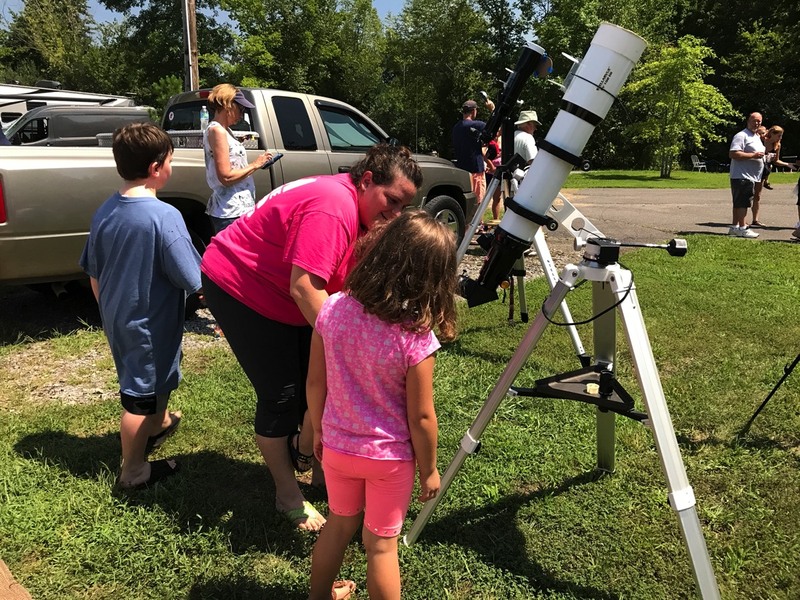 Although hot, the weather was fairly decent on eclipse day with temps in the low 90’s F and partly cloudy skies. 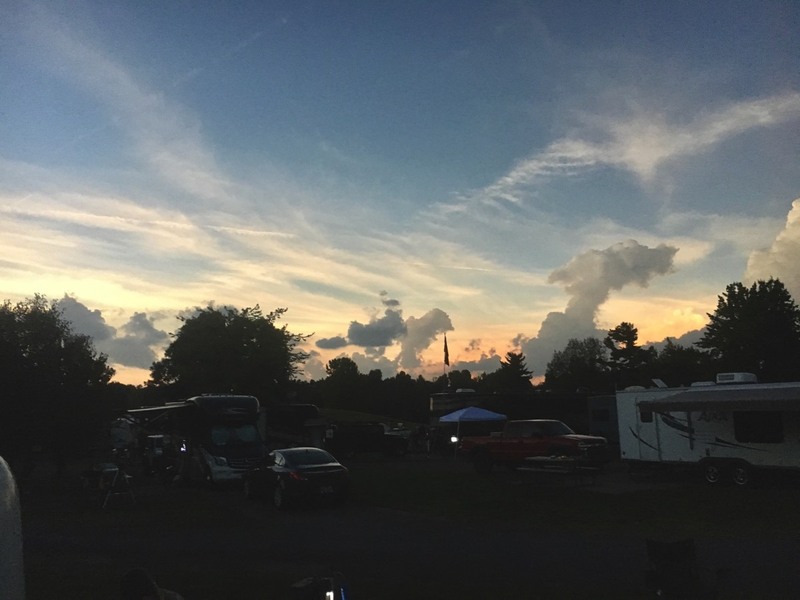 Some high clouds were over the sun during the totality phase of the eclipse but other than limiting the details on the moon, didn’t ruin the view. 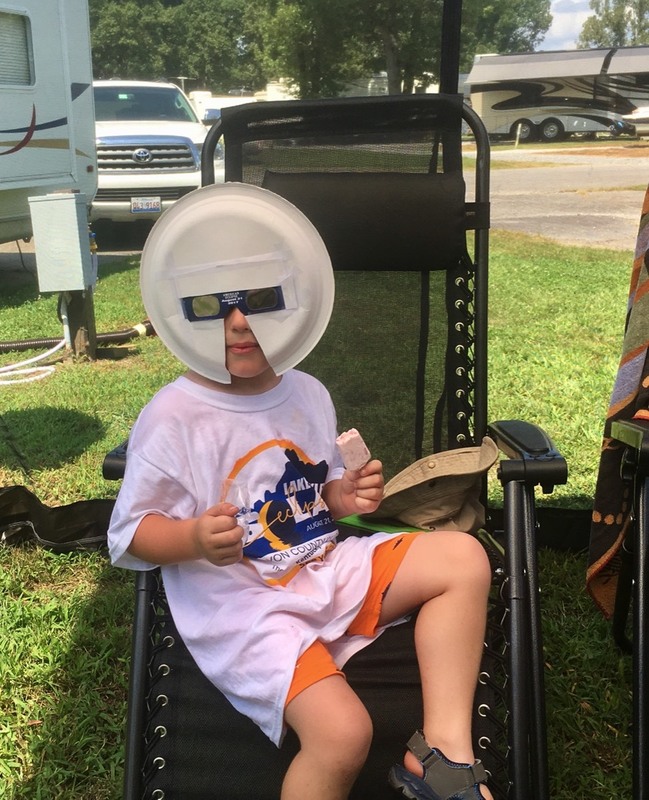 Ourselves and several groups of friends gathered at an RV park on the northwest end of Kentucky Lake and observed the majesty of the eclipse. We were about 10mi south of the exact centerline of the eclipse. Please scroll down the page to see some of the images we were able to capture. 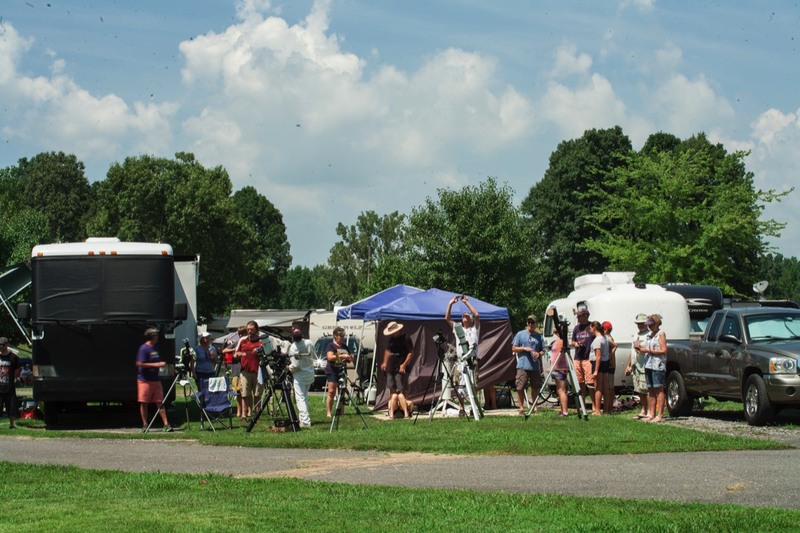 Quite a crowd showed up 30min prior to totality. 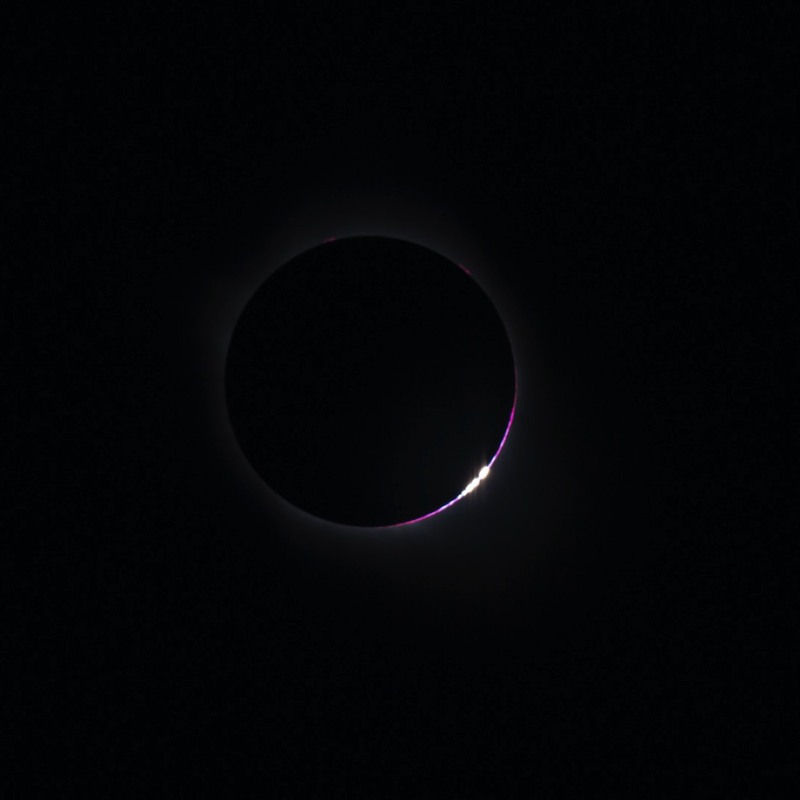 The moon silently started to cross over the sun right on time near noon on 21 Aug. This image was taken at 12:01PM, 4 min after first contact. 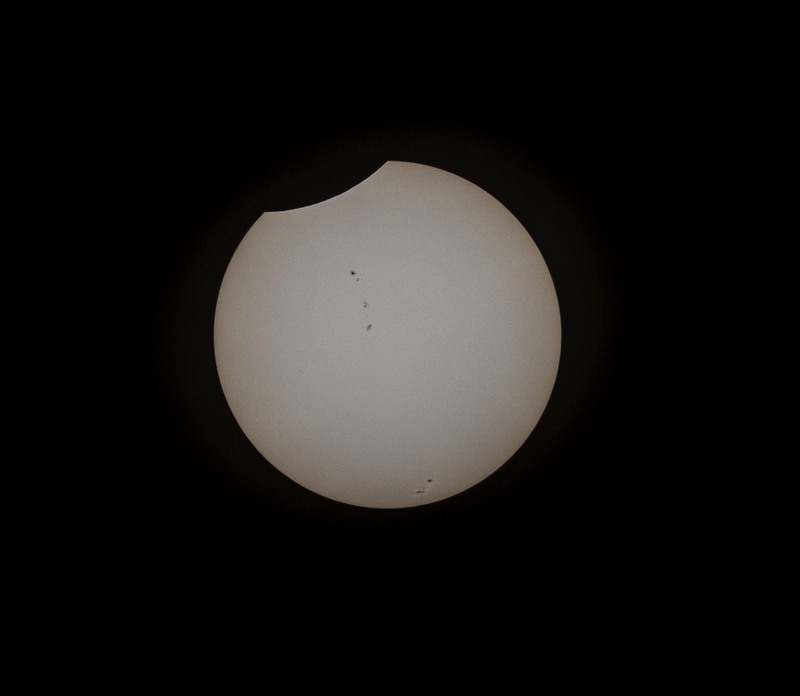 For the next hour and half, the moon would slowly take over the sun. 1/1600sec exposure taken using a solar filter on a Stellarvue SV80s telescope and Canon 60Da Camera. 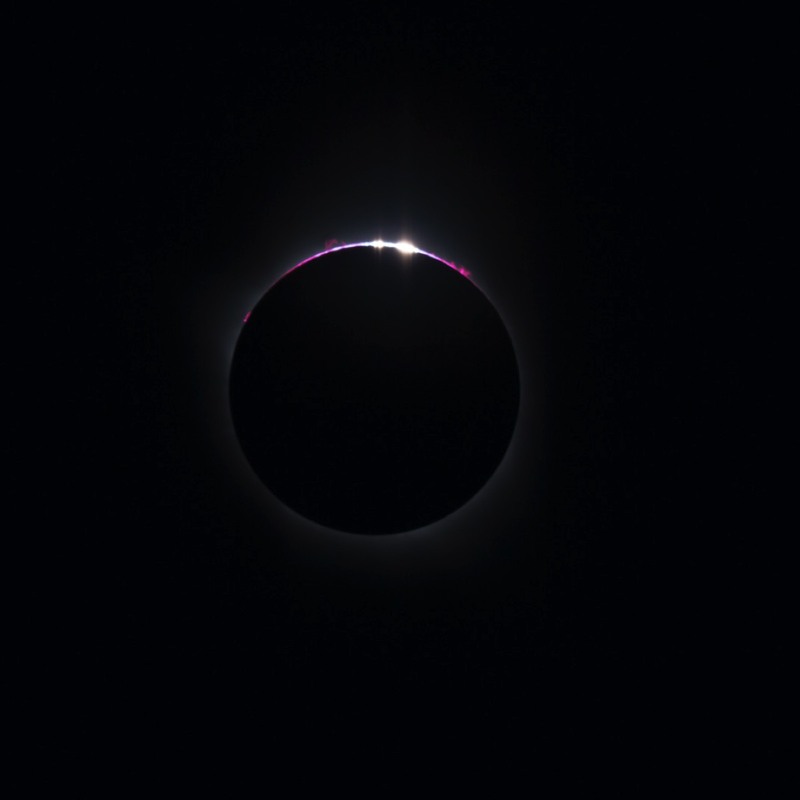 Moments prior to the moon covering the sun we had an awesome display of the diamond ring at 1:22 PM. 1/80sec exposure using a Stellarvue SV80s telescope and Canon 60Da camera.  Totality at 1:23 PM CDT. 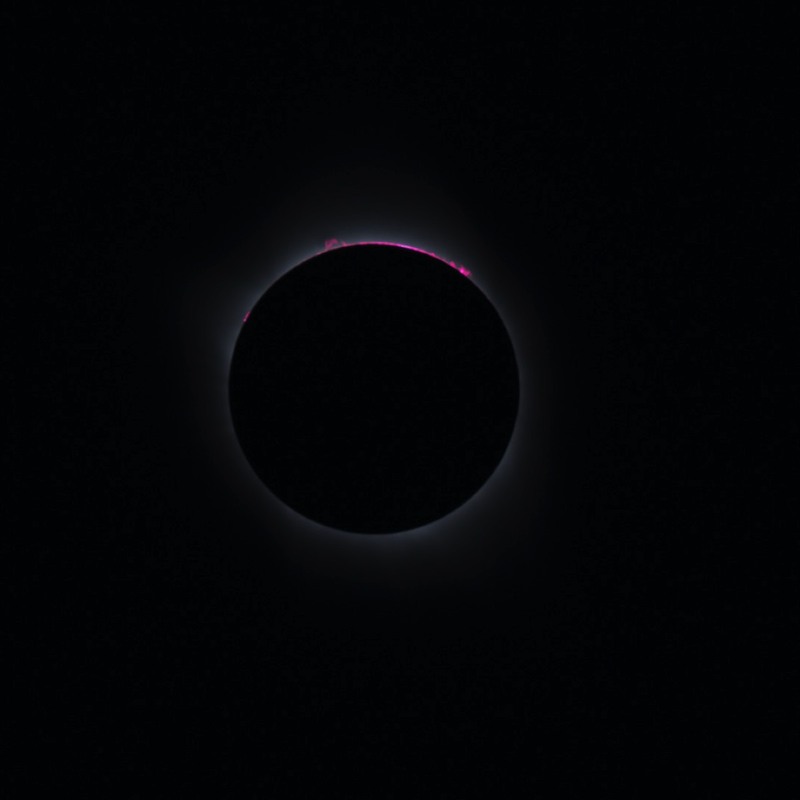 Red prominance’s and the suns chromosphere are visible. 1/1600sec exposure through a Stellarvue SV80s telescope using a Canon 60Da camera. 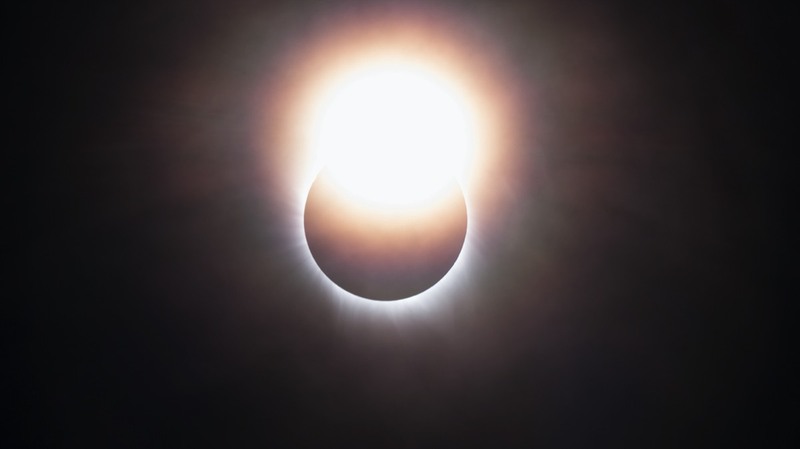 The suns corona. 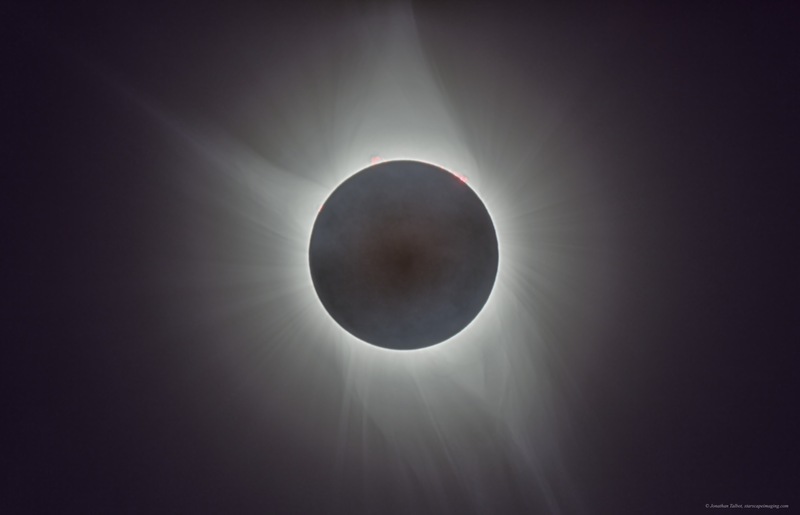 This image is a composite of 9 separate images varying in exposure time from 1/1600 sec to 2 sec and combined as a High Dynamic Range image to show details in the suns corona. Details on the moons surface are visible due to earthshine (reflection of light off earth) however not as good as many other images due to high clouds which were moving through at the time of maximum eclipse. Stellarvue SV80s telescope and Canon 60Da camera. 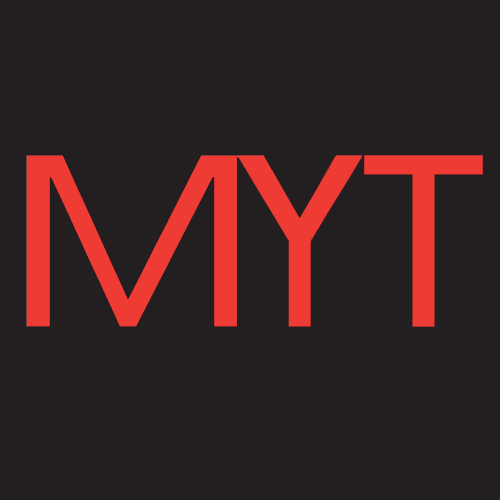 A higher resolution version can be found here. 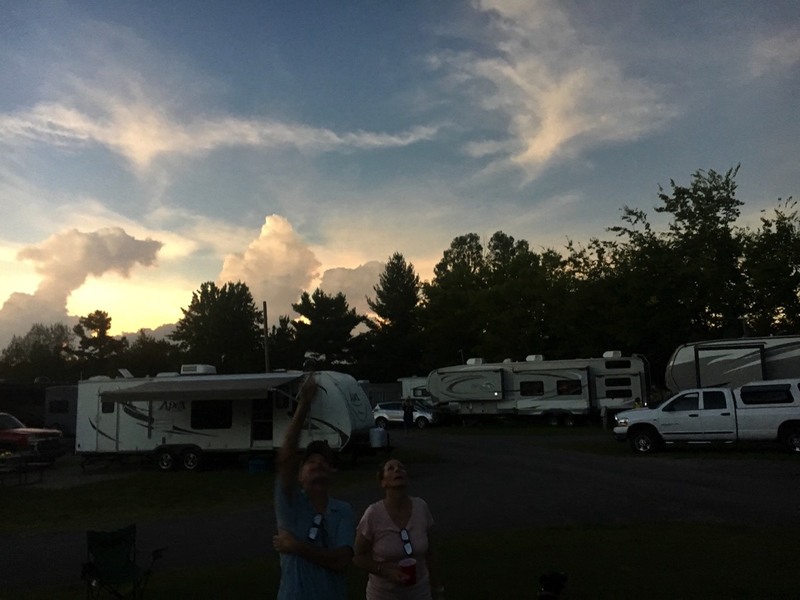 During totality the skies darkened to give a 360deg sunset view! The major planets including Jupiter and Venus were easily visible. 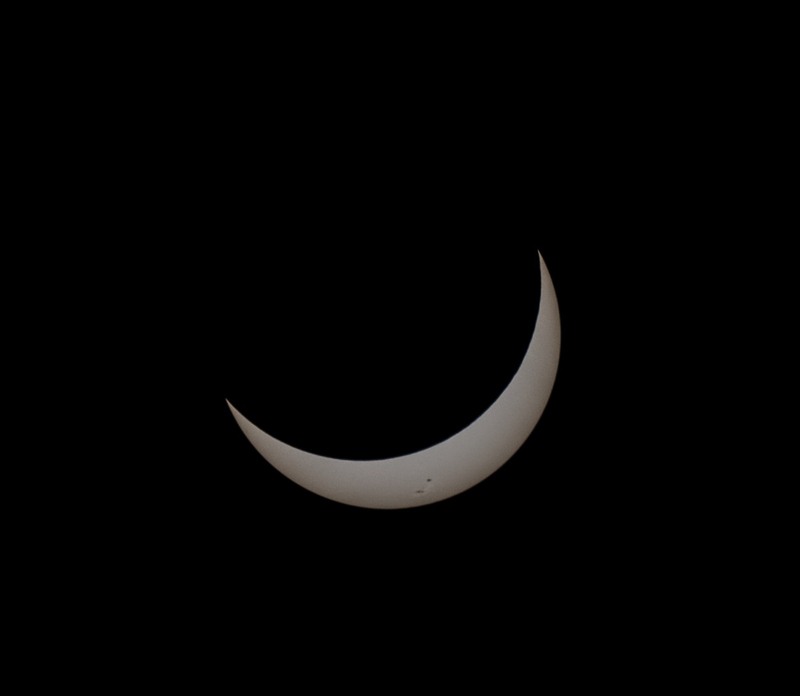 At 1:25pm the first rays of sunlight are again peeking over the moons surface creating Baileys Beads at contact 3. 1/8000sec exposure through a Stellarvue SV80s telescope using a Canon 60Da camera. 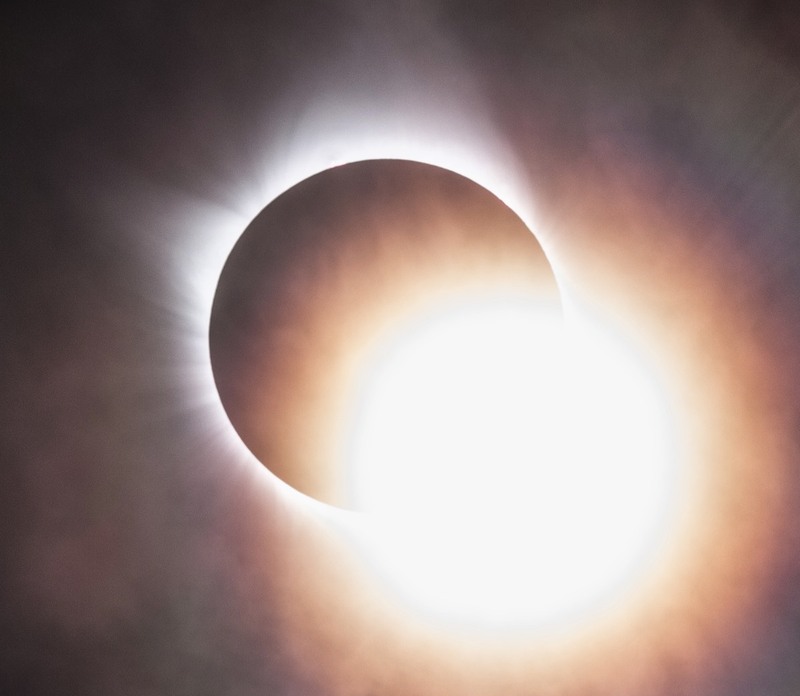 The second diamond ring appears just after contact 4 at 1:25pm. 1/80sec exposure using a Stellarvue SV80s telescope and Canon 60Da camera. The moon silently starts to glide away from the sun and the suns disk is just becoming visible in this exposure. 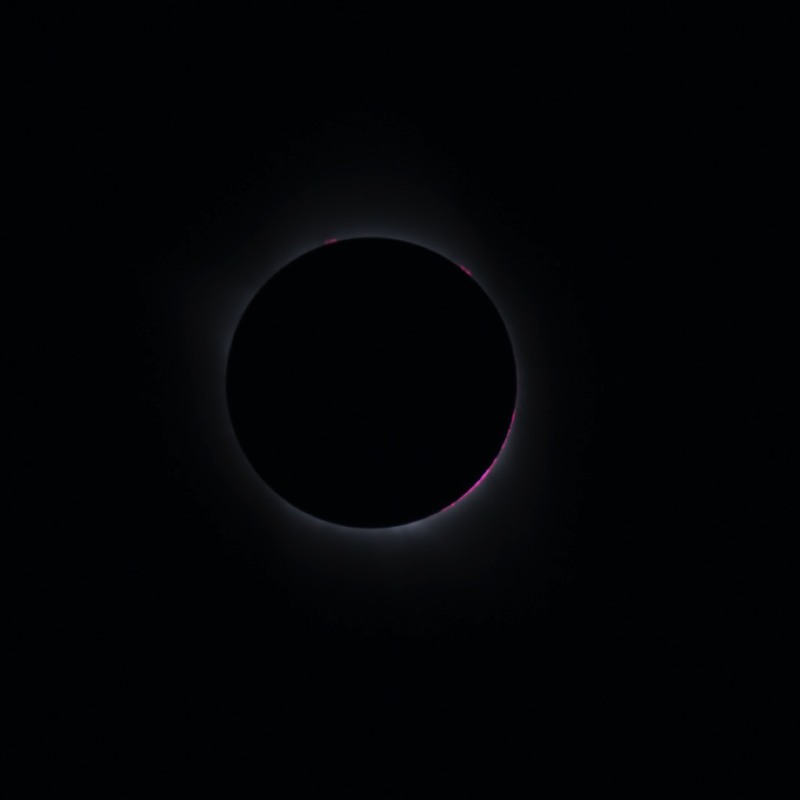 1/1600sec exposure using a solar filter on a Stellarvue SV80s telescope and Canon 60Da camera. 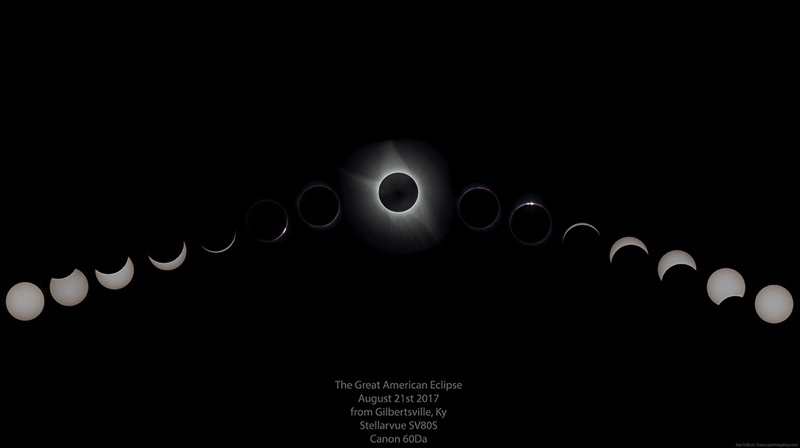 A mosaic composite of images take of the entire eclipse from Gilbertsville, KY. Click here for a higher resolution version.